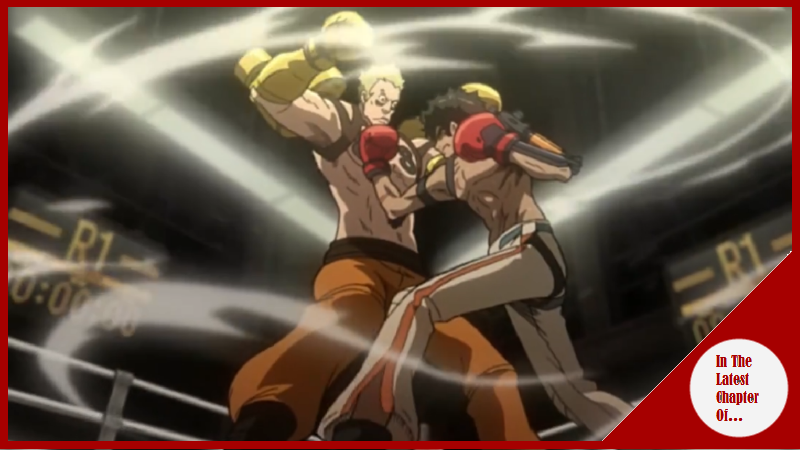 Megalo Box is a spinoff of Ashita no Joe, although it would be more exact calling it a re-imagination of the classic box series; it features a new cast and a futuristic setting where the basic story of Ashita no Joe will be told with the new characters that are highly based on the ones who appeared on the boxing manga. In this setting the Boxers, or Megalo Boxers, go to the ring with some arm implants called Gear that let them throw punches at amazing velocity and strength! Chapter 1: Buy or Die? On a dessert road, a single biker goes with only the heat, the dirt and the wind as his companions, on his mind the memories of a beat up on the ring, under the big white light and the flashes of the entertainment sport haunts him and motivates him to keep going forward, the pain on his purple colored face while his humanity rest on the sacred floor mat where these gladiators with bionic arms appears with the memory and taste of his own wet blood. There our tanned protagonist starts watching an old TV, while his battle attire and his bike gets some due treatment; the first one are some arm complements that push his body on his limits, these artifacts are what he uses on his work, Boxing; the other is just simple the tool he uses to move around. On the TV the news of a new “Megalonia” Competition, the official name of those boxing matches where one uses those bionic arms called “Gear”, the beautiful woman, Yukito Shirato from the Shirato group, this competition is to show the true powers of the people that put their own life at risk by battling on the ring, therefore a new stadium is constructed while they speak; Yukito on her speech was about to say the name of the champion until our young athlete decides to put the TV off. Soon enough the mechanic has made the repairs and everything is ready to go, now it is just the time our Hero sign the documents; he signs with his “Ring name” … Junk Dog or JD for short, JD says that he doesn´t need to sign with his name when he doesn´t even have a Citizen ID, which is the reason why he is not interested in that Megalonia competition… In any case the mechanic tells him that he might go and bet on him, so he better win! JD says that indeed, he will win that night! Soon enough JD reaches the place where his fight will be held, one of the fighters tells him to make his loss “believable” therefore this was a rigged match; JD says that he won´t fake anything tonight since he intends to win this time! He walks toward his manager, a middle aged drunktard, he tells him the rules for the fight; 3 rounds and he has to lose on the last minute… He gives him a little auricular to hear his instructions; JD says that he promised that the next time there won´t be any tricks, that he could fight on a clean match this time… The Manager says that such thing will eventually come; but not today, today he has to follow his instructions and loose, since in any case he is able to defeat anyone if he truly wanted, no? The match is about to begin, JD´s opponent is a random nobody, just some guy with a smug face that would not be able to make it big even if his life depended on it, still the bets are that he has higher chance of winning than JD, so let’s make the majority of people happy by giving him a freebie and letting him win… The match starts and JD´s rival starts strong! A Rain of punches goes towards Junk Dog who blocks the punches, a strange and new tactic since the guy is a slow heater, so there where more opportunity to make this more entertaining by showing how JD had the edge at the start of the battle. Still, JD continues blocking his opponent attacks. The moment comes and JD has qualified his opponent, he is a nobody just like his manager said and if he wants this fight would have ended already; quickly he avoids a punch and a smile is drawn on his face, JD starts punching back and it seems he is about to defeat him, a fist is going towards the face of the predisposed “Winner” until the bell rings and the first round ends! The fight continues and the last minute of the third round is about to come, it´s time to wrap it up and to JD to lose! Meanwhile a person comes near the manager with a Megalonia competition Paper; The Manager says that JD is not fit for that kind of competition, he is a small dog like him and they just can make money on rigged matches… They are not fit for the big shots and have to endure this hard life on this pit… All of that while JD hears everything. A sudden rage can be felt inside JD; but still he let himself loose his face is filled with bruises and his blood has been splattered on the ring´s floor, he see his manager tells him something; but he can´t hear anymore… Once again the glory is for someone who doesn´t deserve it. After the match JD goes to the highway with his bike, his mind is filled with thoughts of what happened alongside the attitude of his drunktard manager and the words that came out of his mouth, once again the sudden rage and desperation comes to him. In another part Yukiko Shirato is seeing the stadium still under construction, her champion, a tall and muscled man with silver hair called Yuri comes, they start talking about the goal of Yukiko by doing this Megalonia competition. It was time to go back and suddenly in front of her a bike was getting dangerously close to her! The Biker, JD, is able to evade her at the cost of his own safety and his bike´s one. Yukiko quickly goes and ask if he is alright? Junk Dog just yells at her asking if she wanted to die or something?! Yukiko says that since this is a private road she though it would be safer, still, she is sorry and give her a card, she will pay for everything…JD rejects such thing and prepares to leave until he is stopped by Yuri, our Hero is able to detect the fighting spirit coming from such man… Both of them start exchanging words and it seems a fight is inevitable. Both JD and Yuri put their fight positions until Yukiko stops them since it´s time for both of them to go; JD mocks Yuri by saying that he is an obedient pet! Still his words doesn´t give any reaction from the Champion, who just gets on the car and leaves alongside the woman. The next day JD is again at the same repair shop, the man in charge has fixed the Gear, although it seems that his bike was in worse condition. JD apologizes himself since he losed, although the Mechanic says that it´s no big deal…He then tells the anecdote that his wife one time told him that he will always be dirt poor because he is too good and trustworthy… Now, his Wife is no longer with him, she left some time ago and is now divorced; still he is still believing in the people and that maybe all of that will be compensated one day… That betting on people is the correct thing to do… So yeah, he might as well be someone who is dirt poor all his life. JD leaves and his manager has the new instructions for him; our Hero starts remembering the words of that alcoholic and it was that he just has to be obedient… JD says that he knows that when the manager tells him that he is better than anybody and that he has true talent in truth those are just white lies; although he wants to believe them… To believe on himself and be recompensed for it… At the very least just once on his life time. JD goes to the ring and the person above it it´s not a random nobody; no…It´s Yuri, the man he was about to fight the last time! Yuri shows his new Gear and is ready to battle against JD; the Manager tries to stop the fight against the desires of Junk Dog who punches him in the face! No one will stop this opportunity to face someone of his caliber! A match between Yuri with his Gear that aligns with his body against Junk Dog whose equipment looks like made from scraps is about to begin! After a one season rest we are back at full force with this anime that has showed a lot of promise for it´s first chapter! I mean the action we got to see, even if it was just a little, was quite well done, so when we get to see a full battle it will be intense I tell you! On a different note, I liked how Junk Dog in the end decided to discard his manager since the guy was onlytelling him false promises of glory or better payments for him, so yeah, Junk was at the bottom of the barrel and he had a hand on his leg that didn´t let him escape and let him, even for a second, be under the light.